From fish and reptiles, cats and dogs, right up to horses, we believe no pet is too big or small. As genuine animal lovers and pet owners, we know how important choosing the right pet care is, and just how hard it can be. ... We aim to make that decision easier for you, we give peace of mind to both you and your pets. Paws Claws and More offers a professional service. Paws Claws and More provides custom-tailored solutions. Paws Claws and More gets optimal results from what is available. I recently relocated for a job, and my dog previously was used to staying with family whilst I was at work. I was really nervous about leaving him, and how he'd react with someone else coming to to walk him, but the team at Paws, Claws and more have been brilliant. Toby soon adjusted to the new routine, and loves his walks with the team. They send me regular photos of their visits with him, and give him lots of fuss and attention. Im so glad to have found a company I trust, it was really hard for me to leave him, but I now feel completely relaxed knowing the team are looking after him. Great business. Alphie loves his walkers. They take time and effort to ensure satisfied customers. Professional yet friendly, helpful and even at short notice they will do their best to accommodate customer’s needs. No hesitation in recommending them. Every member of the team are genuine animal lovers (which is more than can be said for some of these types of business in my experience) and they will all go above and beyond the call of duty to make sure every animal in their care is happy and well cared for. My two dogs would fret terribly if they had to go into kennels but now, they barely notice I’m not there! I honestly cannot recommend PC&M highly enough. Thoroughly recommend, always reliable and very flexible with last minute changes to my requirements. Most importantly my dogs are happy and relaxed being looked after in their own home by people who go above and beyond. I have used Paws Claws & More on a few occasions and can't thank them enough for providing transport as I don't drive, to take me and my cats up to the local vets. Sadly quite recently I had to take one of my cats to the vets he was very ill and can't thank Wayne enough for showing such compassion as I had to have Max put to sleep. As far as I am concerned this company provides an excellent service to the local community and means that many famlies can still have pets and go out to work as well, in the knowledge that their pets are well cared for. 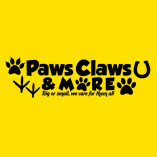 Would always recommend Paws Claws and More to anyone they certainly have my support well done guys & gals. I wanted someone reliable to look after my Labrador Kelly. Phil came to my home, I was happy with the meeting and now I so pleased I have someone I can trust to look after Kelly, he seems a happy boy too.